Rösjöbadens Camping is situated 12 km north of Stockholm-City in a beautiful natural environment. 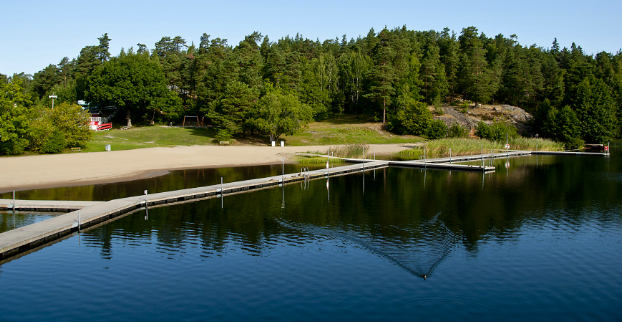 The swimming lake Rösjön is adjacent to the Camping site, with a beach, jetty´s and a diving tower. It is approx. 15 minutes by car into Stockholm City, and 35 minutes by bus and subway. Our Camping site is a Drive in camping consisting of 190 lots with electricity. It is a full service Camping Resort, and the service facilities includes kitchen, laundry, showers, WC and dishwasher. There is a Restaurant / Bar, Grill & Fast food as well as an icecream kiosk. In the Front desk you can get help with information regarding Stockholm´s tourism attractions, such as the amusement park Gröna Lund, Skansen, The Old Town, Museums or transportation. We also provide a guest computer and an asortment of groceries. Rental of canoes, SUP (Stand Up Paddle) and miniture golf. Rösjöbaden offers accommodation in newly built cabins of highest standard for up to 4- or 6 people. All cabins has a loft and private outdoor patio. The facilitys include a fully equipped kitchen with owen, TV and WiFi. Price comment: Prices from 1200 SEK per night.